Properties in Saint-Romain-et-Saint-Clément average 4.7 out of 5 stars. Property 3: Gite With Private Pool And Panoramic Views, perfect getaway! Property 6: 200 year old renovated country farmhouse. Property 9: Cottage in Perigord in a former meta-mill near Brantome. Modern, calm & great views!!! Property 14: Modern, calm & great views!!! Farm and separate guest house with beautiful views of the valley. Property 17: Farm and separate guest house with beautiful views of the valley. Charming cottage on a lovely estate. Property 19: Charming cottage on a lovely estate. 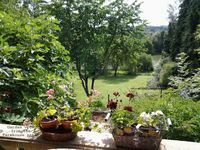 Property 20: Gite in quiet hamlet for rent. Property 22: A combination of contemporary comfort and the atmosphere of a bygone era. Property 36: Very spacious cottage with a separate guest house on a medieval domain. Tranquility, privacy, comfort, beautiful views and a private pool! Property 45: Tranquility, privacy, comfort, beautiful views and a private pool! This must be what heaven feels like! I cannot say enough about our stay here. First of all, John &amp; Carolyn are the most delightful people! They met us at the property and walked us through everything. We stayed in the Farmhouse and of course, it was even more charming than the pictures show (if that is possible). The property has a HUGE garden out back that is so well taken care of. There are shaded areas and sunny areas to choose from. I had my eye on the hammock but ended up loving the sectional under the covered patio. It was so lovely to wake up in the morning and sit outside with nothing but the sounds of the occasional bird and Mr. Hoot Owl. So peaceful and relaxing which is exactly what I was going for! The house is beautifully decorated and has a real relaxing vibe. The beds were very comfortable; I slept better than I had in a long time. You couldn't want for anything! John &amp; Carolyn really have thought of everything. I would selfishly love to keep this gem to myself but it truly was one of the most delightful stays I've had and must be shared. I hope I can come back in the near future. Annette P.